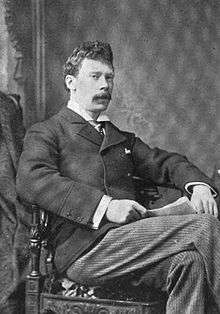 Sir Arthur Thomas Quiller-Couch (/ˌkwɪlərˈkuːtʃ/; 21 November 1863 – 12 May 1944) was a Cornish writer who published using the pseudonym Q. Although a prolific novelist, he is remembered mainly for the monumental publication The Oxford Book Of English Verse 1250–1900 (later extended to 1918) and for his literary criticism. He influenced many who never met him, including American writer Helene Hanff, author of 84, Charing Cross Road and its sequel, Q's Legacy. His Oxford Book of English Verse was a favourite of John Mortimer's fictional character Horace Rumpole. Quiller-Couch was born in the town of Bodmin, Cornwall, by the union of two ancient local families, the Quiller family and the Couch family, and was the third in a line of intellectuals from the Couch family. His younger sisters Florence Mabel and Lilian M. were also writers and folklorists. His father, Dr. Thomas Quiller Couch (d. 1884), was a noted physician, folklorist and historian. He married Mary Ford and lived at 63, Fore Street, Bodmin, until his death in 1884. His grandfather, Jonathan Couch, was an eminent naturalist, also a physician, historian, classicist, apothecary, and illustrator (particularly of fish). 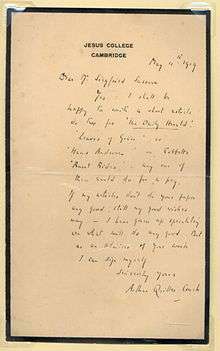 His son, Bevil Brian Quiller-Couch, was a war hero and poet, whose romantic letters to his fiancée, the poet May Wedderburn Cannan, were published in Tears of War. He also had a daughter, Foy Felicia, to whom Kenneth Grahame inscribed a first edition of his The Wind in the Willows attributing Quiller-Couch as the inspiration for the character Ratty. He was educated at Newton Abbot Proprietary College, at Clifton College, and Trinity College, Oxford, where he took a First in Classical Moderations (1884) and a Second in Greats (1886). From 1886 he was for a brief time a classical lecturer at Trinity. After some journalistic experience in London, mainly as a contributor to the Speaker, he settled in 1891 at Fowey in Cornwall. In Cornwall he was an active political worker for the Liberal Party. He was knighted in 1910, and in 1928 was made a Bard of the Cornish cultural society Gorseth Kernow, adopting the Bardic name Marghak Cough ('Red Knight'). He was Commodore of the Royal Fowey Yacht Club from 1911 until his death. Quiller-Couch died in May 1944 after being hit by a jeep near his home in Cornwall in the preceding March. He is buried in Fowey's parish church of St. Fimbarrus. In 1887, while he was attending Oxford, he published Dead Man's Rock, a romance in the style of Robert Louis Stevenson's Treasure Island, and later Troy Town (1888), a comic novel set in a fictionalised version of his home town Fowey, and The Splendid Spur (1889). Quiller-Couch was well known for his story "The Rollcall of the Reef", based on the wreck of HMS Primrose during 1809 on the Cornish coast. He published during 1896 a series of critical articles, Adventures in Criticism, and in 1898 he published a completion of Robert Louis Stevenson's unfinished novel, St. Ives. From his Oxford time he was known as a writer of excellent verse. With the exception of the parodies entitled Green Bays (1893), his poetical work is contained in Poems and Ballads (1896). In 1895 he published an anthology from the 16th- and 17th-century English lyricists, The Golden Pomp, followed in 1900 by the Oxford Book of English Verse, 1250–1900. Later editions of this extended the period of concern to 1918 and it remained the leading general anthology of English verse until Helen Gardner's New Oxford Book of English Verse appeared in 1972. In 1910 he published The Sleeping Beauty and other Fairy Tales from the Old French. He was the author of a number of popular novels with Cornish settings (collected edition as 'Tales and Romances', 30 vols. 1928–29). He was appointed King Edward VII Professor of English Literature at the University of Cambridge in 1912, and retained the chair for the rest of his life. Simultaneously he was elected to a Fellowship of Jesus College, which he held until his death. His inaugural lectures as the professor of English literature were published as the book On the Art of Writing. His rooms were on staircase C, First Court, and known as the 'Q-bicle'. He supervised the beginnings of the English Faculty there — an academic diplomat in a fractious community. He is sometimes regarded as the epitome of the school of English literary criticism later overthrown by F. R. Leavis. Alistair Cooke was a notable student of Quiller-Couch and Nick Clarke's semi-official biography of Cooke features Quiller-Couch prominently, noting that he was regarded by the Cambridge establishment as "rather eccentric" even by the university's standards. Quiller-Couch was a noted literary critic, publishing editions of some of Shakespeare's plays (in the New Shakespeare, published by Cambridge University Press, with Dover Wilson) and several critical works, including Studies in Literature (1918) and On the Art of Reading (1920). He edited a companion to his verse anthology: The Oxford Book of English Prose, which was published in 1923. He left his autobiography, Memories and Opinions, unfinished; it was nevertheless published in 1945. His Book of English Verse is often quoted by John Mortimer's fictional character Horace Rumpole. Castle Dor, a re-telling of the Tristan and Iseult myth in modern circumstances, was left unfinished at Quiller-Couch's death and was completed many years later by Daphne du Maurier. As she wrote in the Sunday Telegraph on April 1962, she began the job with considerable trepidation, at the request of Quiller-Couch's daughter and "in memory of happy evenings long ago when 'Q' was host at Sunday supper". He features as a main character, played by Leo McKern, in the 1992 BBC television feature The Last Romantics. The story focuses on his relationship with his protégé, F. R. Leavis, and the students. His Cambridge inaugural lecture series, published as On the Art of Writing, is the source of the popular writers' adage "murder your darlings". He is mentioned briefly in The Well of Lost Plots by Jasper Fforde as one of the few authors with a name beginning with the letter "Q". St Ives (1898), completing an unfinished novel by Robert Louis Stevenson. A collected edition of Q's fiction appeared as Tales and Romances (30 volumes, 1928–29). ↑ Brittain, Frederick, Arthur Quiller-Couch, a Biographical Study of Q. Cambridge: University Press, 1947; p. 3: "he did not adopt the hyphen until 1889"
↑ Hanff, Helene (5 August 1986). Q's Legacy. London: Penguin Books Ltd. p. 177. ISBN 978-0-14-008936-3. Retrieved 3 March 2012. ↑ Johns, Jeremy Rowett (2000). "The QUILLER family of Polperro". Polperro Heritage Museum. Retrieved 2 March 2012. ↑ Johns, Jeremy Rowett (2000). "The COUCH family of Polperro". Polperro Heritage Museum. Retrieved 2 March 2012. ↑ Somerville, Christopher (5 November 2006). "Well founded belief in the magic of water" (newspaper). The Age. Melbourne (5 November 2006). Retrieved 3 March 2012. ↑ Royal Institution of Cornwall (23 November 1864). "Antiquarian and Literary Intelligence". The Gentleman's Magazine and Historical Review. London: John Henry and James Parker. 216 (January–June 1864): 68. Retrieved 3 March 2012. ↑ Couch, Bertha (1891). Life of Jonathan Couch, F.L.S., Etc., of Polperro, The Cornish Ichthyologist. Liskeard: John Philp. p. 160. ↑ Cannan, May (November 2002). "Tears of War:The Story of a Young Poet and a War Hero". Cavalier Books. ↑ Auctioned by Bonhams on Tuesday 23 March 2010 for £32,400: Flood, Alison (24 March 2010). "First edition of The Wind in the Willows sells for £32,400". guardian.co.uk. Archived from the original on 26 March 2010. Retrieved 25 March 2010. ↑ "Obituary - Eminent Man of Letters - Sir Arthur Quiller-Couch". Glasgow Herald. 13 May 1944. Retrieved 11 February 2016. ↑ "Sir Arthur Quiller-Couch - Find a Grave". findagrave.com. Retrieved 29 November 2013. ↑ Of the original edition nearly half a million copies were issued, according to the introduction to the NOBEV, 1972. The extended edition appeared in 1939; NOBEV, p. v. In 1939 the content was revised: about 40 poems were then omitted from the first three-quarters of the book and about 40 others added; in the rest about 70 poems were added and roughly the same number omitted; more poems were added to represent the first 18 years of the 20th century; NOBEV, p. v.
↑ Woodcock, George (Winter 1974). "Old and New Oxford Books: The Idea of an Anthology". The Sewanee Review. The Johns Hopkins University Press. 82 (1): 119–130. JSTOR 27542806. ↑ Eagleton, Terry (1983). Literary Theory. Oxford: Basil Blackwell. p. 30. ISBN 0-631-13259-7. Terry Eagleton contrasts the "patrician dilettantes" and "devotees of Sir Arthur Quiller Couch" [sic, no hyphen], with the "offspring of the provincial bourgeoisie" ... "entering the traditional universities for the first time". The Leavisites, says Eagleton, had not "suffered the crippling disadvantages of a purely literary education of the Quiller Couch kind". ↑ du Maurier, Daphne; Quiller-Couch, Arthur, Sir (1979) . "Sunday Telegraph article published as introduction". Castle Dor (1979 ed.). ↑ ""Screen Two" The Last Romantics (TV episode 1992) – IMDb". Retrieved 3 March 2012. A semi-fictionalized account of the life of writer F.R. Leavis, his mentor Arthur Quiller Couch, and Leavis's own students at Cambridge University. ↑ Quiller-Couch, Sir Arthur (2000) . "XII. On Style". On the Art of Writing: Lectures Delivered in the University of Cambridge, 1913–1914 (Online ed.). Bartleby.com. ¶6. Retrieved 3 March 2012. Chisholm, Hugh, ed. (1911). "article name needed". Encyclopædia Britannica (11th ed.). Cambridge University Press. Archer, William (1902). "A.T. Quiller-Cough." In: Poets of the Younger Generation. New York: John Lane, the Bodley Head, pp. 94–104. Joshi, S.T. (2004). "Sir Arthur Quiller-Couch': Ghosts and Scholars". In: The Evolution of the Weird Tale. New York: Hippocampus Press, pp. 49–52. Mais, S.P.B. (1920). "'Q' as Critic." In: Books and their Writers. London: Grant Richards, pp. 200–230. Wikimedia Commons has media related to Arthur Quiller-Couch. The Warwickshire Avon by Sir Arthur Quiller-Couch New York : Harper & Bros.
"Archival material relating to Arthur Quiller-Couch". UK National Archives. 'Quiller-Couch Family Papers' at the Beinecke Rare Book and Manuscript Library, Yale University.